Peach trees are one of the least demanding fruit trees you can grow. There are a handful of diseases and pests that plague them, but since the fruits ripen early in the season, problems generally do not get out of hand. The one maintenance task that should not be overlooked is pruning. Your peach trees will be healthier, more productive and easier to work with if you set up an annual pruning routine and stick to it. Unlike many other fruiting plants, peach trees are not pruned while they are dormant. Pruning them while the weather is still cold makes them susceptible to dieback and overall less cold-hardy. Ideally, you should prune peaches just as the buds swell enough for you to start to see pink. It's better to prune a little late than a little early. You don't want the tree oozing sap. Peach trees fruit on 1-year old wood, so they can be pruned rather hard. Remove about 40% of the tree each year, to encourage new growth after pruning, so that there will be fruiting branches every year. Remove older, gray shoots. They will not fruit. Leave 1-year old shoots. These will be reddish in appearance. Peach trees are pruned into an open "V", or vase shape, with 3-5 well spaced, main branches forming the vase. This differs from other fruit trees that have one central trunk, or leader. The main branches should angle out and upward at about a 45-degree angle, leaving the center open to sun and air. Prune out all dead, damaged and diseased branches. This is true of all trees and especially on trees, like peaches, that fruit on new wood. To keep the tree at a harvestable height, top off all the branches at the highest height you can comfortably reach. If you prune without a ladder, you will have not choice but to prune at a reachable height. Choose your main branches and prune out any other large branches, especially any in the center of the tree, growing upward, and those growing downward or horizontal. Remove any spindly, pencil-thin branches and any that are growing toward the interior of the tree. Remove any shoots that point straight up or down. Cut back the remaining red shoots to about 18 inches, at an outward facing bud. Don't forget to prune the suckers at the base of the tree. Ideally, pull them off with your hand, if they are small enough. They will be less likely to regrow if they are pulled. If your tree is overgrown and there is no new growth within reach on a tall branch, remove the whole branch. Regular pruning in the following years will ensure there is plenty of new growth lower on the tree, where you can reach it. If you do not have enough upward curving main branches, find one that has new growth growing in the right direction and cut back to the new growth -- this will be among the main branches next season. You can remove shoots developing in the center of the tree at any time. They will block sun and air from getting to the fruits and taking them out during the summer usually means less to remove in the spring. Plant peach trees in a sunny, well-draining spot where there is some protection from wind. Most peaches require a cold dormancy, but there are varieties labeled "low chill," like "Tropic Snow," and "Earligrande," which do better where winters are mild. 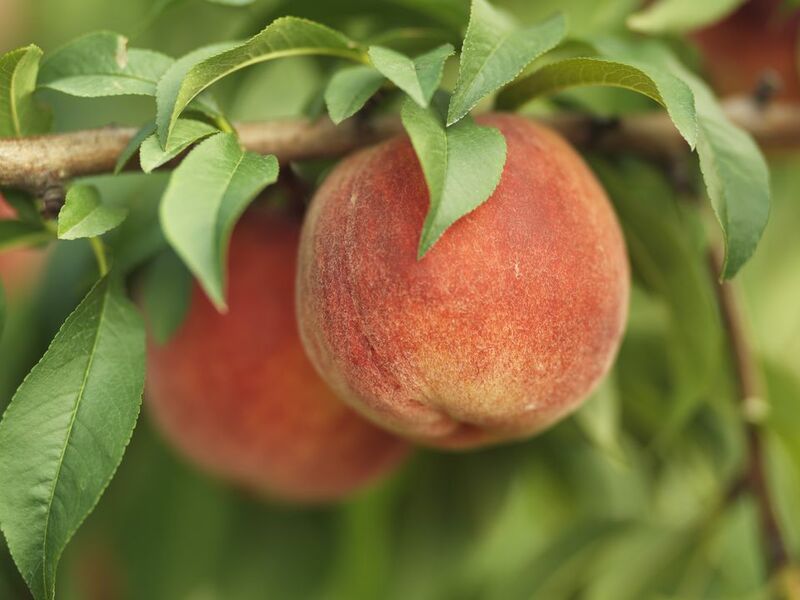 Make sure your peach tree gets at least 3 inches of water a month. Feed your trees after the petals fall. Thin fruits to 6-8 inches apart. You can do this while the tree is in bloom or after June drop. Thinning will produce larger fruits. Don't pick the fruits until they are fully ripe, because peaches will not continue ripening off the tree. Ripe fruits will easily pull off the tree with a slight twist. They should be starting to soften, but still somewhat firm, and have reached their full color (which will vary with varieties). A few days at room temperature seems to sweeten the flavor of peaches. Peach trees are not long-lived. Planting a new tree every 5-6 years will ensure you are never without a peach tree. Patio peach trees only grow to about 3 feet tall and can be kept in containers. Gardeners in USDA Zones 4 and colder will need to give these winter protection.